While school is still out in most places, our team is not just in but breaking ground in new locations, innovating using new media, enhancing existing partnerships, talking face-to-face with road users, and letting the latest research be their guide. Don't miss the compilation of AIP Foundation's work in Cambodia 'The Passenger Helmet Story 2011-2012', which will take you through the challenges we've faced and the success we've achieved there over the last two years. Mumbai to host world medical students' meet – Road safety will be one of the important issues discussed at the general assembly of the International Federation of Medical Students' Association, to be held in Mumbai. Still in the starting gate – Underdeveloped transport system could seriously impede Vietnam's development plans, as the number of vehicles rockets to 37 million units as of July this year. AIP Foundation's Safe Kids Walk This Way (WTW) is expanding to Binh Dinh Province for the 2012-2013 school year. The orientation workshop for this new program was organized successfully with over 60 local participants, including provincial and district authorities, school administrators, teachers, parents, media, and Safe Kids Vietnam (SKV). SKV informed stakeholders about WTW program implementation procedure and ways the stakeholders can become more involved. A needs assessment was conducted through focus group discussions with key provincial, district, community, and school stakeholders, focused on the relevance of interventions and accountability to its stakeholders. The safety issues and appropriate interventions for improvement will be identified based on the results of these discussions. Proposed environmental modifications for Model School Zone at Nguyen Thi Minh Khai School include the installation of rumble strips, crosswalks, speed limits, traffic lights, a new sidewalk, and drainage coverage. These interventions will address the risks that students face en route to school, due to the uncovered drain system running along the school gate forcing students to walk in the road, lack of paved roads and crosswalks, as well as the high volume and speed of cars. Modifications are scheduled to be completed in September. AIP Foundation has completed the school assessments for its new initiative Zooming in on Road Safety to determine which schools will participate in the pilot project during the 2012-2013 school year, sponsored by Intel Products Vietnam. Zooming in on Road Safety will rally secondary school students and parents to help capture the reality of young road users through trainings in traffic safety and photography for students at target schools. In July, the Ho Chi Minh City Department of Education and Training committed to supporting Zooming in on Road Safety by sharing ideas and, specifically, helping to televise an important component of the program. AIP Foundation conducted school visits, interviewed administrators, and selected three pilot schools, Trần Quốc Toản, Phước Long A, Tăng Nhơn Phú B, based on project criteria, including proximity to high-risk roads and school commitment to road safety. 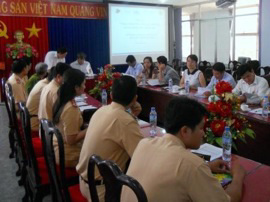 Stakeholders met in HCMC on August 14th to finalize the child helmet enforcement plan, as part of the "Children also need a helmet" campaign. The meeting was attended by the Vice Director General of Traffic Police (C67), the representatives from the National Traffic Safety Committee, WHO, and all the relevant municipal authorities including Ho Chi Minh City Traffic Safety Committee, Traffic Police, Departments of Education and Training, Health, Information and Communications, Youth Union, as well as road safety bureaus of the target districts. Police enforcement on child helmet use is expected to run for four months with a press conference on September 11th to kick-off the program. Police activities will be accompanied by information counters set up in target districts where flyers and helmets are distributed to educate violators who are stopped by police. Billboards and posters are installed across the city, and a documentary will be produced and broadcast specifically about police enforcement on child helmet use. Other ongoing communications activities include airing of the campaign's TV commercial, social media discussions, and various out-of-home channels. Law to enforce helmets for motorcycle passengers – The government has released a draft of a new traffic law that will reduce speed limits, raise fines, and make it compulsory for motorcycle passengers to wear helmets in an effort to cut the death toll on Cambodia's roads. AIP Foundation, Handicap International - Belgium (HIB), and the U.S. Centers for Disease Control and Prevention (CDC) began conducting a roadside user survey August 7 in Phnom Penh, Kampong Speu, and Kandal provinces. This survey aims to benchmark attitudes, behaviors, and beliefs of Cambodian motorcycle drivers and passengers including children for the next phase of the Cambodian Helmet Vaccine Initiative (CHVI). AIP Foundation launched Paste Your Face at Dream Land Park with a family-friendly event promoting passenger helmet use, as part of its public awareness campaign "Always care. Always wear a helmet." The launch at Dream Land Park marks the start of the Paste Your Face photo competition on Facebook estimated to engage 3,000 to 6,000 contestants competing for the chance to win top prizes by submitting photographs of their families wearing helmets. The event attracted 200 guests, including senior government officials, families, students, media, private sector, road safety stakeholders, and celebrities. Guests participated in many family-oriented, interactive activities and had their photographs taken at the Paste Your Face installation. In the week following the launch, the reach of AIP Foundation-Cambodia's Facebook page increased by more than 1,000% percent. Entries to the Facebook competition will be accepted until September 10th and finalists will be selected on October 19th. 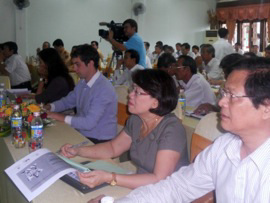 AIP Foundation joined a road safety stakeholder meeting at Cambodian Red Cross (CRC) head quarter office. CRC, Handicap International - Belgium (HIB), and Coalition for Road Safety reviewed their activities with university students to create a road map for collaboration and partnership to promote road safety. AIP Foundation has committed to intensifying its efforts to promote helmet use among university students, as well as empowering them to become role models in its motorcycle passenger helmet use campaign. CHVI's public awareness campaign "Always care. Always wear a helmet." has focused on the need to use a helmet consistently and without exception. Since the launch of this campaign in December 2011, CHVI has used national and local multimedia platforms to reach its audience with the message that helmet use among family and friends is a simple act of care. In a household survey in the target locations, 41% of respondents remembered the campaign, of whom 75% reported being much more likely to wear a helmet as a passenger themselves. 83% and 89% were much more likely to encourage their children or spouse, respectively, to wear a helmet. Since October 2011 when an M&E framework was developed with the U.S. Centers for Disease Control and Prevention (CDC) CHVI's Helmets for Kids has provided helmets and road safety education to 4,542 students and 150 teachers at six schools. When helmets were not worn by any of the students before project implementation, student helmet use rates increased to 93% on average after ten to twelve weeks. CHVI's advocacy efforts led, in November 2011, to the inclusion of children in passenger helmet use mandate in the new traffic law, now under review by the Cambodian government. Follow this link to see the full report. Traffic police: Less checkpoints, more law enforcement – Police will change road checkpoints to make traffic flow more smoothly & enforce important traffic laws, including crash helmet use. Department of Disaster Prevention and Mitigation (DDPM) called concerned parties together on August 17 against an increase in road accidents during festival holidays in Thailand, such as the New Year and Songkran. In 2011, there were 6,712 accidents during these two festivals combined, resulting in 629 deaths and 7,226 injuries. The event took place at Sakaew School, Muang District, Sakaew Province and was attended by over 1,000 guests including DDPM, Local Rescuer Clubs, Department of Land Transport, Road Accident Victims Protection Co., Ltd., Accident Prevention Network under Thai Health Promotion Foundation, and Thai Motorcycle Enterprise Association, as well as teachers, students, and citizen road users. 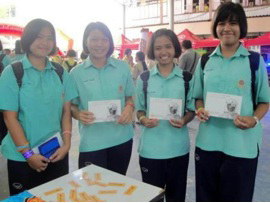 AIP Foundation exhibited a booth on its campaign activities in Eastern Thailand, which drew attention from many teachers and students and displayed public service announcements. Sigma Elevator donated 195 helmets to the students and teachers of Wat Nakprok Primary School in Bangkok on July 13th, as part of AIP Foundation's Helmets for Kids program. This month AIP Foundation followed-up with teachers with a workshop on teaching new road safety material and practicing their lessons. The training was structured to be collaborative with teachers working with small groups to brainstorm new ideas and best practices. Students and teachers both learned a new card game about traffic signs, a resource which teachers will reuse in their classrooms throughout the year. Mercedes Benz Road Safety Summer Camp – Mercedes Benz organized a children's Road Safety Education Summer Camp in Beijing from August 6th to 12th, combined with the Third Sports Culture Festival of Beijing. All the children who were willing to participate in the camp were free to join. The results from Sichuan University's baseline study completed last month have been released. This research, as part of the pedestrian safety project implemented by AIP Foundation and Chevron Ltd., will inform road safety curriculum development for grades one to six at two target schools, where the majority (64.1%) of students walk to school. Of the students who do not walk, 17% commute by motorbike, 11.1% by school bus, and 7.8% by public bus. 4. Road conditions nearby the school are poor. For example, there are (1) not enough road deceleration zones and many of them are worn out, (2) no crosswalk in front of the school gate, (3) no warning signs to alert drivers to be careful about school children in the area, and (4) haphazardly parked vehicles and debris piled on the route to and from school. A group of advisors has been formed from the local educational department, police, and schools and consulted on the structure of the curriculum. The curriculum will be ready for pilot testing at two schools in Kai County in October 2012. 'Own Your Own Boda' – A startup helps motorcycle taxi drivers in Kampala, Uganda, buy their bikes, which in turn helps them buy homes, start businesses, and send their kids to school. From January through May 2012, the Uganda Helmet Vaccine Initiative (UHVI) ran a radio media campaign focused on educating motorcycle taxi operators, known as Boda boda, on the need to wear helmets. The campaign was informed by a baseline study and was comprised of radio advertisements and DJ mentions on popular radio channels. The main finding is this campaign's likeliness to change behavior: approximately 9 in 10 boda boda operators were willing to consider wearing a helmet after listening to the helmet advocacy advertisements. Awareness was high across locations, indicating the effectiveness of the selected radio stations. Findings also signified that Luganda-language messaging had a greater reach than that in English and respondents helped to identify the clearest and most impactful messages, among five different advertisements. About 8 in 10 respondents agreed to the messages that each communication intended to convey. The key message received from this campaign was that wearing a helmet when riding a boda boda can help in saving a rider's life.